Oregon law mandates any business serving alcohol must also serve food. So with a high concentration of some of the most excitingly diverse restaurants in the country, you’ve got the makings for a killer happy hour scene. Here, Portland’s top spots to score delicious deals without breaking the bank. A Portland institution, Nostrana is Chef Cathy Whims’ homage to the comforts of rustic Italian cooking. Pair the $5 Campari and soda with the Insalata Nostrana, a Caesar-like salad starring radicchio and rosemary croutons, and one of her wood-fired pizzas or homemade pastas (The capellini tossed with Marcella Hazan’s legendary buttery tomato sauce is simple yet sublime, and only $9). Where else can you build a full meal (a really solid one to boot) out of snacks and drinks all priced under $8? Start with a glass of punch and nibble on crispy pork lumpia before tucking into a hearty meatloaf sandwich with some local Pinot Noir. End the evening on a sweet note with assorted petit fours and ice cream. Every night, from 9pm to closing, you and a pal can score a 4-course tapas tasting for a mere $15 each. If you’re not in the mood to share, indulge in the legendary empanadas at a discount. The smoked butternut squash and fontina cheese empanadas are not to be missed. Hot, crispy, gooey, savory, and subtly sweet – they’re so addictive you’ll be requesting another round after the first bite. Chef Sarah Pliner’s elegant sensibility – think Asian flavors graced with French techniques – elevates even the most humble foods to great new heights. Her tempura green beans, for example, are delicate and puffy and accompanied by a green curry sauce. Even the hot dog gets the haute treatment, with a house-smoked sausage, creamy papaya slaw, and pillowy Franz Bakery bun. Happy hour at this celebrated downtown spot by Chef Vitaly Paley kicks off earlier than most at 2pm, so the flat top burger – it’s a crowd pleaser with griddled beef, gooey cheddar, bread and butter pickles, and dill mayo – is just $6 (Before 2pm, it’ll cost you $12). A $3 basket of hand-cut fries makes for the perfect partner. New to the world of Russian food? Then beeline to happy hour at Chef Bonnie Morales’s spirited restaurant. It’s the perfect opportunity to sample the house favorite pelmeni—pillowy Siberian dumplings stuffed with onion, pork, beef and veal, and one of their infused-vodka cocktails. The Baba Yaga is a bracing mix of chamomile vodka, Strega (an Italian herbal liquor) and fresh lemon juice. The happy hour menu at this cozy tavern located at Hotel Monaco reads like the greatest hits of the snack world. Imagine fried confit drumsticks glazed with sweet and spicy caramel, tacos stuffed with tender, slow-cooked brisket and pickled cabbage and Canada’s culinary claim to fame, poutine. Did we mention that you can score these discounted goodies every day of the week, including weekends? 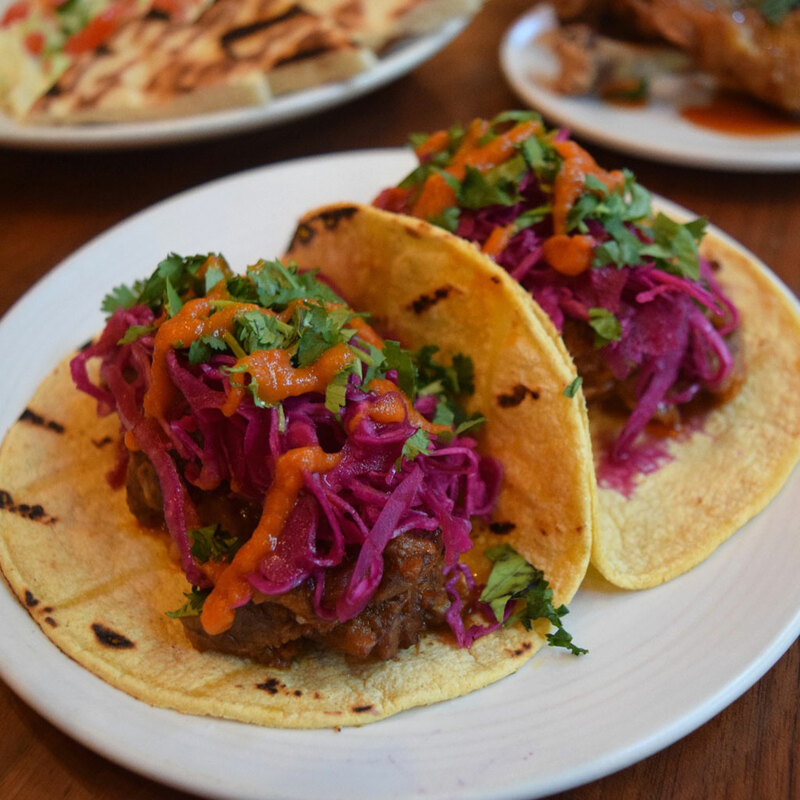 Get the chance to feast on beloved chef Gregory Gourdet’s pan-Asian bites not once, but twice daily – there’s also a late night happy hour from 10pm to midnight – on the top floor of the Nines Hotel. From the famous, impossibly tender wings to vegetable udon to pork belly and kimchi fried rice; you’ll find something for all sizes and types of appetite. Happy hour at this sustainable sushi pioneer is like having the best of both worlds. Not only can you fill up on reasonably-priced nigiri and rolls, you can also feel good knowing that what your eating isn’t taking a toll on our planet. Not a fan of fish? Try the lacy vegetable tempura and savory grilled hanger steak.